Anger and guilt are left at the doorway. Class begins with a prayer, and then for an hour and twenty minutes, my classmates and I listen attentively as Dr. Johnson enlightens us in his 300 level history course- the History of Slavery & Race in America. 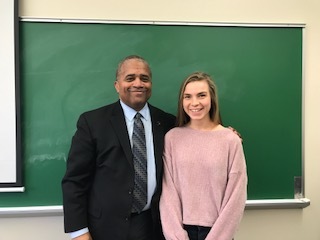 We are different races, we have different political affiliations, and our religious ties vary, but for that set amount of time, we come together to discuss the history of race and slavery in this nation. Most of us have been exposed to at least some prior knowledge about the history of slavery. I personally remember learning about the Underground Railroad for the first time in second grade and driving to the Civil War’s many battles in high school. However, the issue of racism and the problems that come with it are not always so open. For many, racism is an uncomfortable topic, better left undiscussed so as not to offend or be misunderstood. But after just a few weeks in this course, I believe quite the opposite. All of us have been impacted by racism in one way or another. Taking the time to study this allows us to better understand ourselves and the history behind this nation. As a history major I’ve been asked the same prompts over and over: “Was the [insert time period] a period of social progress or regression for the U.S?” What this class has taught me is that it depends on who you’re asking. The U.S was forged from a society that operated under systemic racism. Even our constitution was written to be ambiguous enough to deny rights to certain people. I shouldn’t have to go into great detail to describe America’s racial issues today. They’re prevalent in our society, and we can either look the other way or try to do something about them, and that’s where the importance of history comes in. We have made a great deal of progress since the first African American slaves were brought to the United States in 1619, but racism still affects our society even today. Racism is a result of willful ignorance and ethnocentrism, and this combination was the beginning of a long road of race relations in our country. Slavery, the Civil War, Social Darwinism, Jim Crow, eugenics, immigration laws, segregation, deportation- it’s all a part of our nation’s history of slavery & race. It’s imperative we are able to sit down and discuss these topics openly and honestly. As I’m finishing up my history major, I’ve had a good deal of exposure to different historical periods throughout the world. Having a greater understanding of history, specifically America’s history has allowed me to see the progress we have made as a nation, but it also highlights the issues our country still faces. It is one thing to talk about the past, but our discussions are surprisingly relevant to the present. 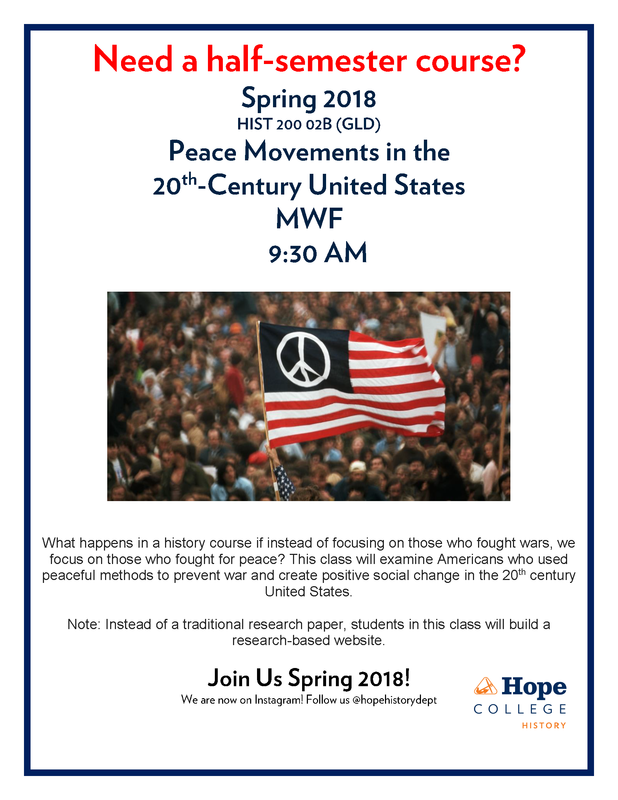 Two new history courses start march 1st! 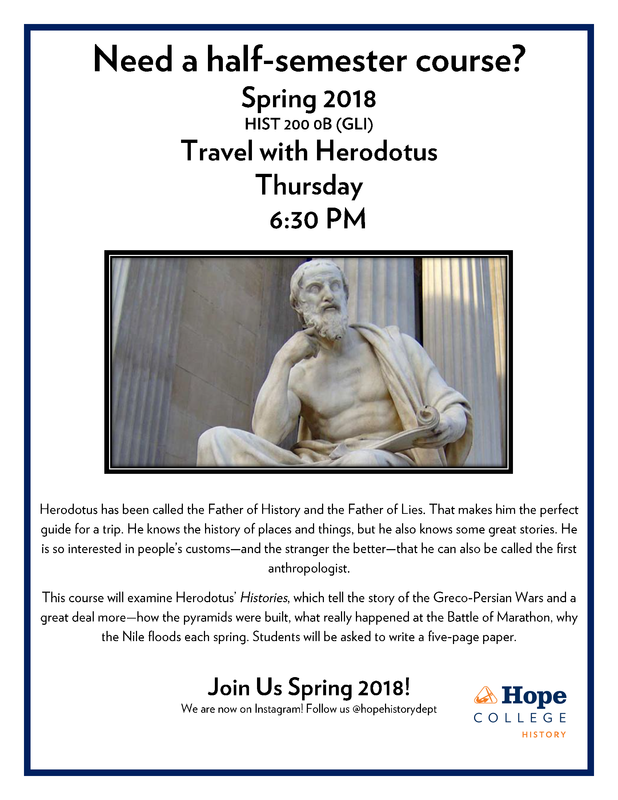 Posted on February 15, 2018 February 15, 2018 Author Raquel NilesCategories Alumni, Faculty, StudentsTags history, Hope College, studentsLeave a comment on Two new history courses start march 1st! Coming out of a class one evening I got a text from my wife: “Guess what the answer was on Final Jeopardy.” I replied, “Since I don’t know what the question was, I can’t know the answer.” She couldn’t remember the exact wording but it had to do with letters written by a Roman and it mentioned the death of his uncle, so the answer had to be Pliny the Younger. She knew this because she’s heard me talk about Pliny for years. He wrote almost 250 letters, including two famous ones that describe the eruption of Mt. Vesuvius in 79 AD, which covered Pompeii and Herculaneum. Pliny’s uncle, Pliny the Elder, died in that eruption. A later letter tells the emperor Trajan how Pliny dealt with Christians in the province of Bithynia (part of modern Turkey) in the year 112. It’s the earliest non-Christian source we have about the Christians. I became interested in Pliny in seminary and graduate school, more years ago than I care to recall. 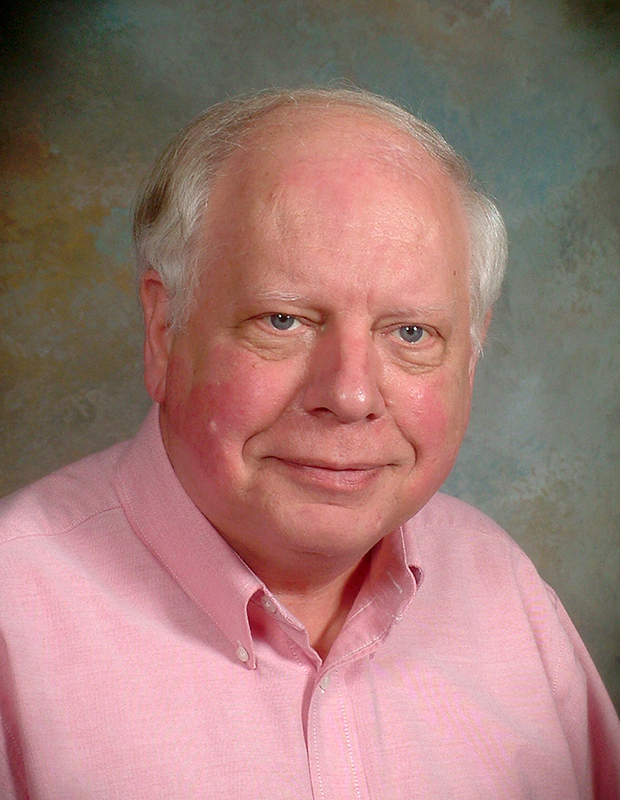 I have used his letters extensively in my research and academic writing, especially in my book, Exploring the New Testament World. Somewhere along the way, I began playing with the idea of writing a historical mystery set in ancient Rome. The main question was who would be my detective. Several writers—Lindsey Davis, Steven Saylor, John Maddox Roberts and others—write Roman mystery series that use fictional characters as their investigators. The more I read Pliny, though, the more I realized he had the skeptical, analytical mind that would make a good detective. So, just as in Final Jeopardy, Pliny was the answer for me. I like punny titles. The phrase “All Roads Lead to Murder” struck me as appropriate for a Roman mystery novel. That meant I would need to set my first novel at a time in Pliny’s life when he was traveling. In the spring of 81 AD he was returning from a year of government service in Syria. I found a small publisher that was interested, and off we went. That publisher put out three Pliny novels before the owner died. I was fortunate to find another small publisher right away, and the series now runs to six books, with a seventh due out this year. I’ve been gratified by critical comments about the books. Library Journal said the second in the series, The Blood of Caesar, was one of the 5 Best Mysteries of 2008, “a masterpiece of the historical mystery genre.” One reviewer of the sixth book, Fortune’s Fool, said, “Bell reinforces his place among those who are pushing the mystery beyond genre, toward the literary.” I thought I was just telling stories. 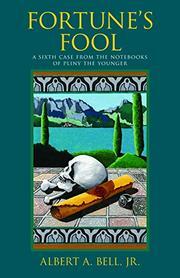 All of the Pliny books are available online, along with my contemporary fiction and a couple of non-fiction books.